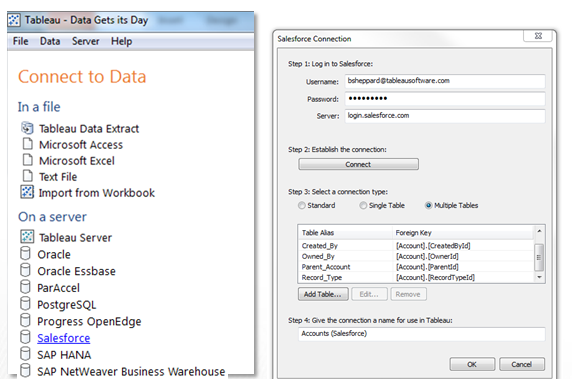 Starting with the Tableau Version 8 beta, connect to Salesforce.com in the same easy-to-use interface that you use for files, spreadsheets, databases, and Hadoop. We first previewed the Salesforce connector at the November 2012 Salesforce Dreamforce conference in San Francisco. Without data, you’re just another person with an opinion. With the combination of Salesforce and Tableau, use analytics and custom dashboards at every step of the sales process, from prospecting, territory analysis, and lead management to pipeline coverage, pipeline quality, account management, forecasting and more. Sales people create and share their own custom dashboards with easy to use, drag & drop visuals. No more canned reports. Track and analyze real-time or near-real-time indicators to make sure that you and your sales team are performing every day. In Version 8 (in beta), simply choose Salesforce in the Connect to Data list, enter your Salesforce login, and use a predefined standard join or choose your tables. Here at Tableau, we’re big users of Salesforce. So we were super excited when we could connect directly to Salesforce beginning with the Tableau Version 8 beta. We use Salesforce company-wide for sales and customer relationship management. We started by extracting Salesforce data to SQL and connecting Tableau to the SQL servers. Now, our sales people, sales operations, and marketing team can connect directly to Salesforce in Tableau. Force.com gives you lots of options to bring data directly into Salesforce, but you may have sales quotas, demographics, market sizing, customer records, or other data to blend from your spreadsheets, databases, cubes or Hadoop cluster. With the Force.com Canvas framework pilot program, you can embed Tableau dashboards as tabs in Salesforce.com. The Tableau Salesforce direct connector allows you to create data extracts that you can update incrementally and share with your department or organization-wide. Publish data sources, Tableau workbooks, and dashboards to Tableau Server to share with your team and avoid application programming interface (API) caps. Visit the Salesforce Analytics solution page for sample dashboards and use cases. Nice post and the information given this blog is really good.